Onions as far as the eye could see. So maybe not quite that many but I did have a serious over-supply last week. I could have sworn I was out of them so bought a kilogram bag at the markets on Sunday. Little did I know, I not only had onions but, I already had a full bag in the fridge along with a few loose ones. I know onions last a while but even I didn’t need 2.5kg of onions sitting around nor did I have the fridge space to spare. 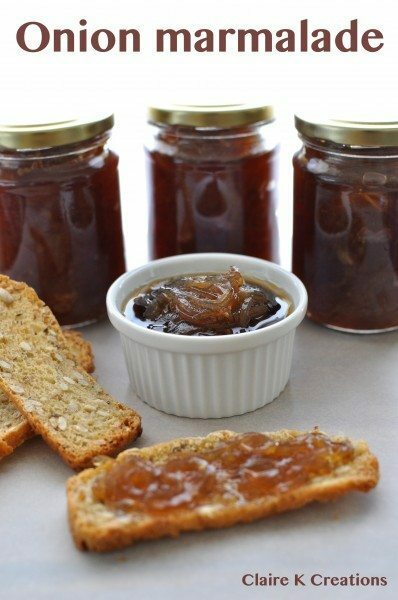 My night time reading is quite often cookbooks and last weeks book of choice was the Country Women’s Association preserves book which just happened to have a recipe for onion marmalade that used 1kg of onions – perfect! 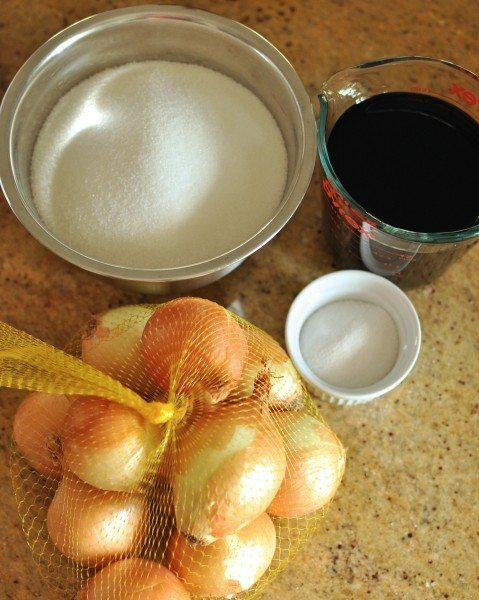 It’s another recipe for the 4 ingredient ladies this one – just onions, salt, sugar and vinegar. It’s seriously low-budget too with the total cost coming in at about $6 total. I didn’t even need to buy anything else. The recipe just called for ‘vinegar’ so I had to take a punt on what sort to use. I went for 1/8 balsamic and the rest white. You’ll need a rather large pot to make this in and the wider the better. 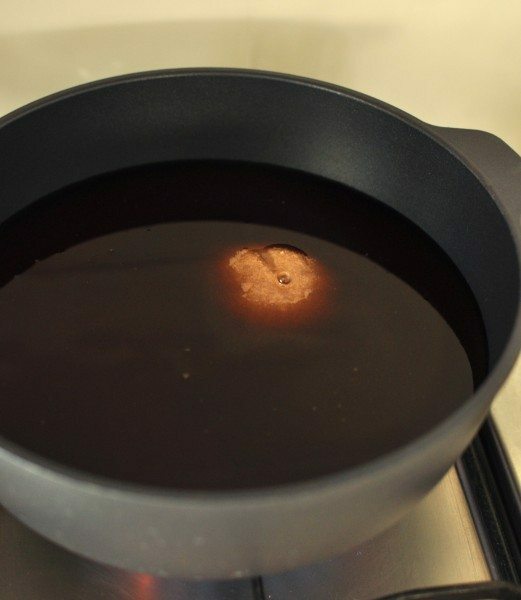 Start with just the sugar and vinegar in the pot and heat it over medium heat, stirring, until the sugar has dissolved then bring it all to a boil. The slicer attachment on my food processor was christened with this recipe and I honestly don’t think I could have made it without it. My eyes were tearing up just peeling the onions. 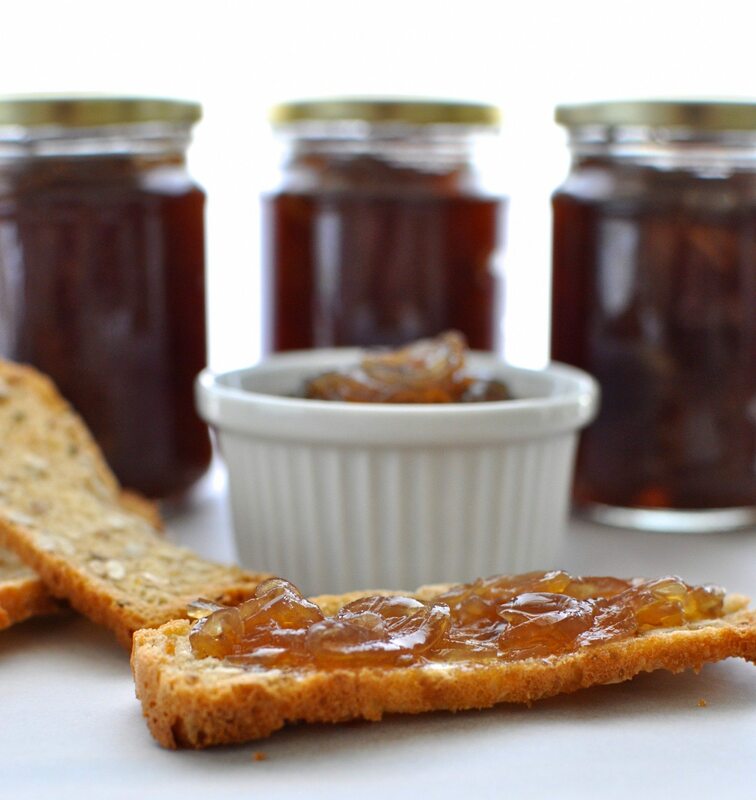 The next day I was recalling my marmalade-making to mum. She got a great bargain on onions a few weeks earlier and made the same thing in the slow-cooker but cutting the onions by hand, she was cursing the onion man’s smooth talking sales skills by the time they were all sliced. Add all the onions to the pan and again bring it to a boil. 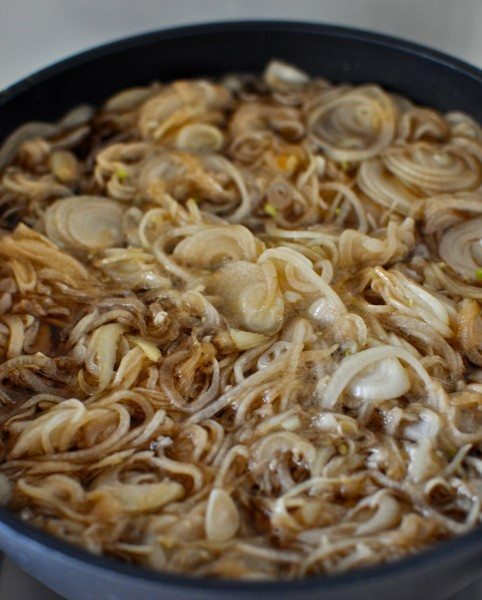 Reduce to a simmer and let it simmer away for 2 to 2 1/2 hours or until the onions are transparent and the liquid is syrupy. I left mine for 2.5 hours. After that time, taste it and adjust the seasoning if you need to. I added a little extra salt to mine. Two days before I’d had a terribly failed attempt at a new multigrain bread recipe. It was meant to be a tall, fluffy loaf. As you can see from the slices, it was miserably flat. All was not lost though. I sliced it up very finely, lay the slices on a baking tray and sprayed them with a little oil and a sprinkle of salt then baked them until they crisped up. Stored in an air-tight container, they’ll keep for ages. Once the onions are ready, bottle them up. Apparently they will keep for ages and ages and only get better with time. I’ve already got recipes flying around in my head but pairing it simply with feta in a fritata or tart sounds like a good place to start. Top a steak with it, serve it with cheese and crackers, stir it into a casserole – whatever you do you’ll love it. Enjoy! What about you? Do you tend to over-buy things? In a big saucepan, stir the sugar, vinegars and salt together and then bring to the boil. Add the onions to the pot and stir them through then bring it to a boil again. 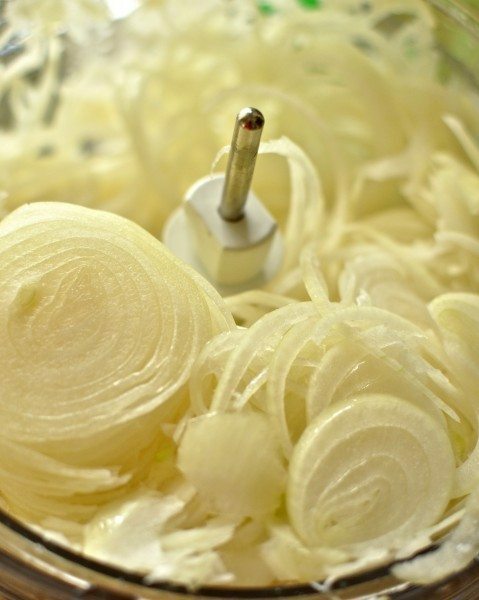 Reduce it to a simmer and leave it to cook away for 2 - 2½ hours or until the onion is transparent and the liquid is thick and syrupy. Transfer it into sterilised jars. I tried your recipe just now. 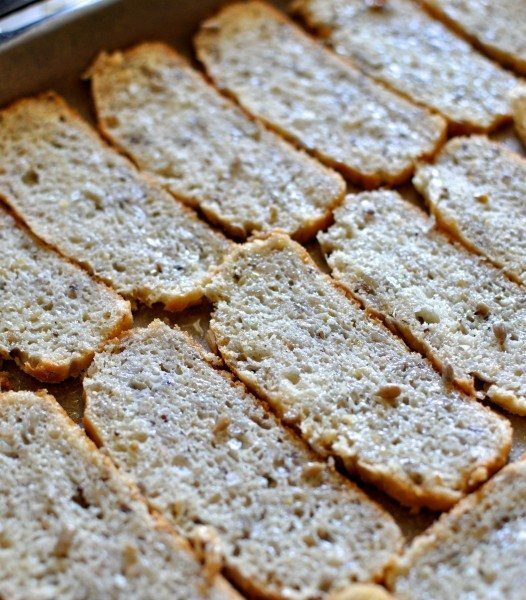 It is easy to make and very, very delicious!! Busy making the onion marmelade. I want to know if I cover the pot while its simmering for 2 hours or leave it open? A quick response would be fantastic, as the marmelade is on the stove already!! Hi Catherine. A bit late now but I usually leave the lid off. Hope it went well! 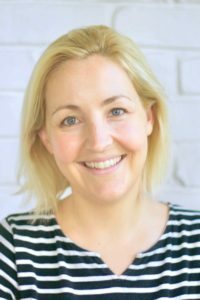 I made your Onion Marmalade (Country Women’s Association) and would like to get a little bit of advice off you. I doubled the recipe and noticed that by the time the marmalade got thick enough, the marmalade was a lot darker than yours. Could you please tell me why this may have happened. I’d just say it caramelised a little more or took a bit longer for the sugars to be released so browned up more? Would also depend on the onions. It will most likely be a slightly different colour every time. I was searching for a recipe for onion marmalade for a show competition in a couple of weeks time. The vast majority of them called for wine or port which I really didn’t fancy. I loved the simplicity of this one. I made it yesterday and just had my first taste with cheese and homemade brioche. Absolutely gorgeous and hopefully a winning jar! Thank you so much for posting it. You’re very welcome Sue! You’ll have to let me know how you go! If you’d like, I’d love you to share a photo of your jam at the show on my Facebook page? I rarely buy too much, but I do often buy a pile of whatever for the purpose of making something like this. 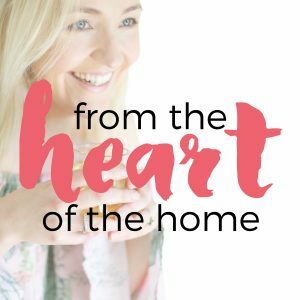 I have a recipe for a red onion relish which is used all the time here, but this recipe sounds really lovely, will definitely make it. Red onion relish sounds delicious. 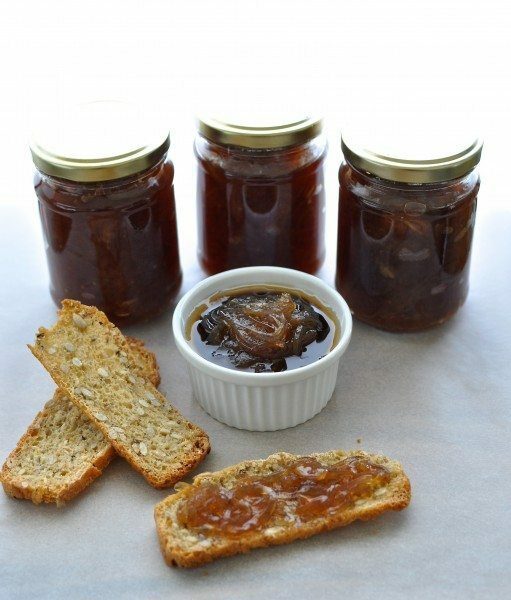 Thanks for the great onion marmalade recipe. 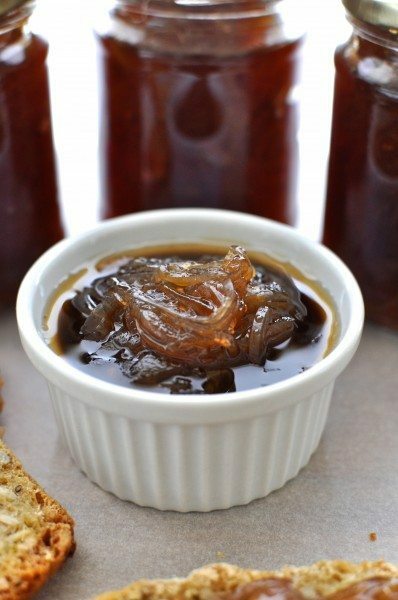 I gave onion marmalade a try recently and hopefully it turned out as well as yours! It’s a really delicious preserve. Isn’t it delicious? So versatile too! Fancy seeing you here! Yay I’m glad I have a definite ‘voice’! Claire, I too am thinking of a zillion ways to use this yummy stuff! I feel like I can taste this from here! 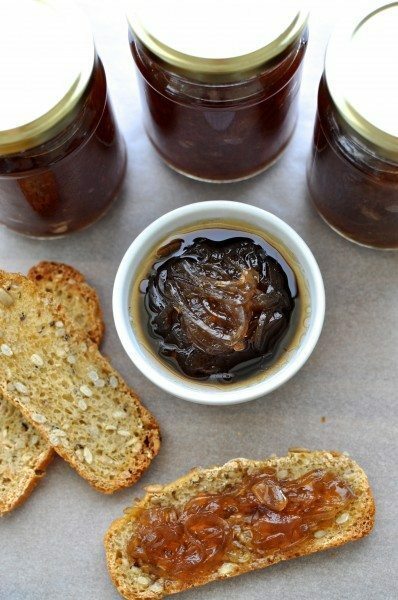 I love a good onion jam. What a gorgeous color. Do you taste sweetness Jen? It’s super sweet! You’re so observant! I’ve just been playing around with the side bar. Oops I must have disabled it!